At DuBois Center, we have a variety of facilities available to serve your group’s needs. Whether you are looking for a more rustic experience, an experience that feels like home, or somewhere in between, we can work with your group to make sure you have the best experience possible during your stay. Download our Facilities Brochure for more information. This section of camp is located on the east side of the main lake, closest to the camp entrance. It is home to Oak Lodge, Hickory Lodge and our cottages. Oak Lodge: This is the main building around which the rest of the camp is built. Our kitchen and dining room are located here. We serve delicious family-style meals for groups of up to 140. Adjacent to the dining area is a versatile meeting room with cozy fireplace and sitting area. The lower level has an additional meeting room. VCR/DVDs and other audio/visual equipment are available to assist with your meetings and presentations. Oak Lodge also houses a small recreational room (ping pong, foosball and billiards), arts and crafts space and a guest room with two beds. Event coordinators or special guests often stay in this room. The spacious porch overlooking the lake invites guests to enjoy a leisurely cup of coffee at sunrise or take time for reflection. 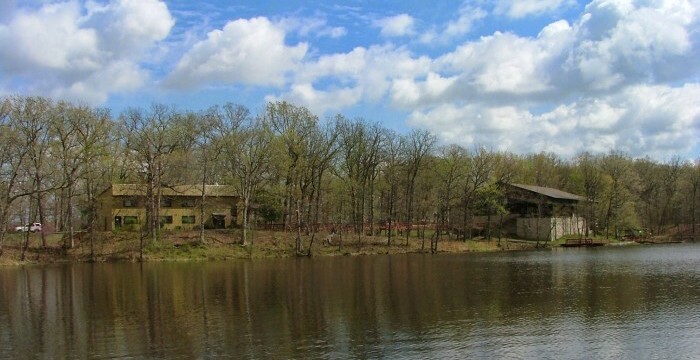 Hickory Lodge: Just a few steps from Oak Lodge, this self-contained, year-round retreat facility has a quiet patio and great view of the lake. Hickory Lodge sleeps groups of up to 30 people comfortably in 11 bedrooms. The bedrooms have several configurations of double and twin beds with centrally located bathrooms and showers. The versatile great room can be easily organized for work sessions with multiple activities or for relaxing around the fire after a day of exploring. A conveniently located kitchenette completes the comfortable feel of your home away from home. Hickory Lodge is just a short distance from Roadside Cottage. Many groups utilize these two facilities together. The Cottages: We have four comfortable cottages to offer groups. Lakeside, Woodside and Coveside are situated near the lake and Roadside is in close proximity to Oak and Hickory Lodges. All cottages feature two bedrooms with 8 comfortable bunk beds each and accompanying restrooms and showers. Each cottage can accommodate 16 people. Three of the cottages feature stone fireplaces and lounge furniture in the middle rooms and have decks with peaceful views. Roadside is handicap accessible but does not have a fireplace. Located across the lake from Main Camp, this area of camp is accessible by boat, by trail and by road. The Rustic Village features multiple cabin areas as well as modern bathrooms with showers and a meeting shelter. There is also plenty of open space to run and play. Rustic Cabin Sites: Together, Fisherman’s Ridge, Sassafrass Hill and Wildwood can accommodate up to 60 campers in rustic cabins. Each cabin has up to four sets of bunk beds. The Barn is home to our equestrian program and our 20 beautiful riding horses. Miles of trails on our camp are waiting to be explored. Rides can be arranged – in advance – for your retreats or event. During our summer camps, campers learn to care for horses, ride the trails and participate in barn chores. Schools participating in Nature’s Classroom program also have the option to ride horses. Swimming, boating and fishing are all part of the waterfront experience. Swimming Area: Certified lifeguards care for our beach and swimming area, which is divided into a shallow and deep end. Outside the swimming area sits our Water Mat. Life jackets are required for all activities outside the designated swimming area. Hawk’s Nest: The boathouse is home to canoes, fishing boats, pontoon boats, life jackets and rescue equipment. All boats are available for use – if reserved in advance. The Spider Web, Birthday Lineup, Bosun Chairs, Slack Wire, All Aboard, Nitro-Crossing, and the Couple’s Walk – all are elements on our teams course and all provide a opportunities for building teamwork and collaboration within your group. The experience is both challenging and joyous – at the same time. Team members begin to experience physical success and recognize that the seemingly difficult is often quite possible when a group works together. Struggles are often the beginnings of maturity, which entails, in part, having real experience with a wide range of natural human reactions – fear, joy, fatigue, compassion, laughter, pain and love and they learn to work as a team. For more lodging and day use information for our facilities, go to our Lodging page.